During its mission, R/V Roger Revelle traveled to ports spanning the eastern U.S. seaboard and internationally to Samoa, New Zealand, Australia, Indonesia, Mauritius, Seychelles, South Africa, Uruguay, Chile, Taiwan, Guam, Tonga, Fiji, Japan, Thailand, Philippines, Vietnam, and French Polynesia, among others. “Since departing from its home port in Point Loma on Dec. 1, 2006, R/V Roger Revelle has conducted 86 missions in many parts of the western Pacific. It has been seen in numerous countries and hosted many U.S. and foreign scientists. The science enabled by this ship’s voyage is contributing new knowledge about the oceans and atmosphere, and will open many additional avenues of research. Our Navy is pleased to have such ships to use and share among federal agencies,” said Dr. Frank Herr, head of the Ocean Battlespace Sensing Department at the Office of Naval Research. The 273-foot ship’s scientific missions involved explorations from the deepest parts of the ocean's remote trenches to the upper atmosphere, covering topics relevant to society and of significance to the U.S. Navy and national security. Research projects covered a broad mix of science, including those related to global climate, ocean acidification, plate tectonics, volcanic processes, resource exploration, ecosystem dynamics, marine mammals, ocean waves and currents, and ocean acoustics. Earlier this year, Scripps scientists and ship operations crews visited Vietnam for a series of ship tours and classes with Vietnamese scientists. That goodwill visit paved the way for physical oceanography expeditions planned off Vietnam in 2013, leading to the establishment of a new scientific collaboration between oceanographers from the two countries since the Vietnam War. Before heading out of San Diego on an ambitious science support schedule next year, R/V Roger Revelle, launched in 1996, will undergo routine maintenance at a West Coast shipyard. Additionally, in San Diego, nearly $300,000 will be spent at local maritime businesses on Roger Revelle upkeep operations and maintenance. Roger Revelle (1909-1991), the ship’s namesake, was director of Scripps Institution of Oceanography from 1951 to 1964. Long associated with the University of California, Revelle’s vision and energies led to the establishment of the UC San Diego campus in 1960. 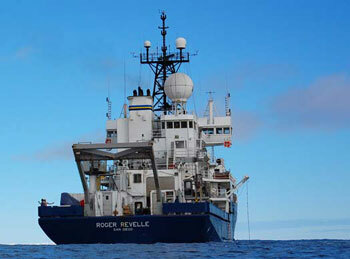 The research vessel was named for Roger Revelle by the U.S. Navy to honor his scientific contributions. He was one of the nation’s most prominent oceanographers, a pioneer of climate change research and a world leader in the application of science and technology to help solve problems in developing countries.